LIUNA showed up in force last Thursday with nearly one hundred workers proudly wearing orange at a rally of more than 400 activists from unions, faith groups and social justice organizations to demand the Austin City Council support better wages for Austin’s construction workers. 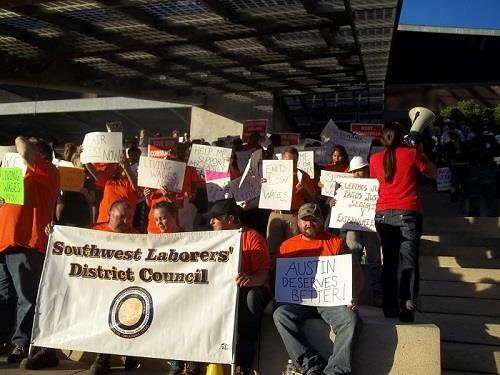 The Austin City Council heard us loud and clear when they voted 6-1 to require construction workers be paid either prevailing wages or a living wage of $11 per hour, whichever is higher, by companies who seek economic development incentives from the city. LIUNA’s ongoing efforts helped lead to the formation of the Special Committee on Economic Incentives by the Austin City Council, which voted on November 27, 2012 to approve and send to the full City Council five amendments to the City’s Economic Development Policy following five months of hearings and discussions with stakeholders from throughout the community. Council members Mike Martinez, Kathie Tovo, and Laura Morrison authored the historic resolution to require living wages, prevailing wages, safety requirements, certified training and worker’s compensation coverage for construction workers on projects receiving tax breaks. The principal author of the law, Austin City Councilor and LIUNA friend Mike Martinez said, "Are those jobs that pay less than $11 an hour, that don't provide health coverage and domestic partner benefits, are those the jobs that we really want in Austin? Do they actually provide an economy here, or do they draw on the economy because they don't have health care, because they're not paying a living wage? I agree that quality of life starts with a job, but I think it starts with a good job, a job that starts with a decent wage."